This portal page is being considered for deletion in accordance with Wikipedia's deletion policy. The American black bear (Ursus americanus) is a medium-sized bear native to North America. It is the continent's smallest and most widely distributed bear species. American black bears are omnivores, with their diets varying greatly depending on season and location. They typically live in largely forested areas, but do leave forests in search of food. Sometimes they become attracted to human communities because of the immediate availability of food. 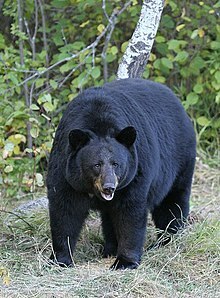 The American black bear is the world's most common bear species. 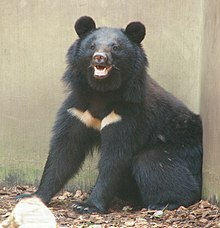 An ursid hybrid is an animal with parents from two different species or subspecies of the Ursidae (bear) family. 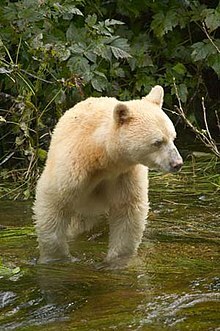 Species and subspecies of bear known to have produced offspring with another bear species or subspecies include brown bears, black bears, grizzly bears and polar bears, all of which are members of the Ursus genus. Bears not included in Ursus, such as the giant panda, are probably unable to produce hybrids. Note all of the confirmed hybrids listed here have been in captivity (except grizzly/polar bear), but there have been hybrids in the wild. 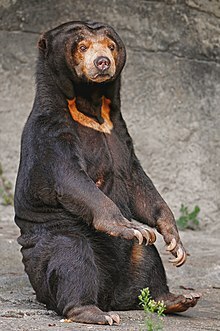 The sun bear (Helarctos malayanus) is a bear species occurring in tropical forest habitats of Southeast Asia. It is listed as Vulnerable on the IUCN Red List. The global population is thought to have declined by more than 30% over the past three bear generations. Suitable habitat has been dramatically reduced due to the large-scale deforestation that has occurred throughout Southeast Asia over the past three decades. A sloth bear at the National Zoo in Washington, D.C. The sloth bear (Melursus ursinus) is an insectivorous bear species native to the Indian subcontinent. It is listed as Vulnerable on the IUCN Red List, mainly because of habitat loss and degradation. It has also been called labiated bear because of its long lower lip and palate used for sucking insects. Compared to brown and black bears, the sloth bear is lankier, has a long, shaggy fur and a mane around the face, and long, sickle-shaped claws. It evolved from the ancestral brown bear during the Pleistocene and through convergent evolution shares features found in insect-eating mammals. 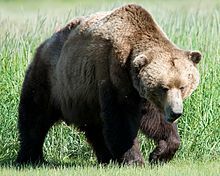 The Marsican brown bear (Ursus arctos marsicanus) (Italian: orso bruno marsicano), also known as the Apennine brown bear, is a critically endangered subspecies of the brown bear, with a range restricted to the Abruzzo National Park, and the surrounding region in Italy. 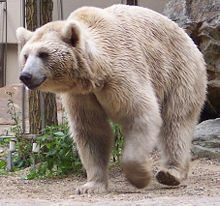 The Marsican Brown Bear is very similar to a regular brown bear with slight differences in its appearance and hibernation techniques. Plionarctos is an extinct genus of mammals of the family Ursidae (bears) endemic to North America and Europe during Miocene through Pleistocene, living from ~10.3—3.3 Mya, existing for about 7 million years. The Alaska Peninsula brown bear or peninsular grizzly (Ursus arctos gyas) is a subspecies of brown bear that lives in the coastal regions of southern Alaska, although according to some sources it is a population of the mainland grizzly bear subspecies (Ursus arctos horribilis), or the Kodiak bear subspecies (U. a. middendorffi). From top to bottom: brown bear, American black bear, polar bear, Asian black bear. ... that artefacts discovered at the Donaldson archaeological site in Ontario include a child's necklace made with bear teeth? ... that in honor of Georgia Tech's 1929 Rose Bowl victory, running back Stumpy Thomason was given a bear cub by a local businessman, which he drove around Atlanta and fed Coca-Cola? ... that in 1866, the English missionary Joseph Salter tried to help five Punjabis who were stranded in London with their performing bear? ... that the Sacramento Valley Development Association built a life-sized bear out of prunes for the 1904 St. Louis World’s Fair? ... that bears are classified as carnivores, but most are omnivorous and the panda is almost entirely vegetarian? ... that Mazaalai, the first Mongolian satellite in space, is named after the endangered Gobi bear? For editor resources and to collaborate with other editors on improving Wikipedia's Bear-related articles, see WikiProject Mammals. Do you have a question about Bears that you can't find the answer to? This page was last edited on 17 April 2019, at 23:23 (UTC).